My fascination with Bollywood is close to satiation, so I've been hunting for new cinematic delicacies. Luckily, Kaigou, the author of the cry havoc blog gave me a very compelling pitch on the subject of Asian TV drama. I've had virtually no contact with that genre of programming, mainly because it is not at all easy to get your hands on it. The best option seems to be downloading bittorrents (un-distributed foreign content is one of those areas where copyright law gets a little fuzzy) with fan-produced subtitles (the subtitles are timed to match the more popular bittorent rips). Fantasy and science fiction doesn't have the same representation as romantic dramas (a genre that doesn't interest me much, although I want to check out "Dr. Champ" a romantic drama about a doctor at the Korean olympic training facility), but Kaigou recommended a Korean drama officially titled "Special Investigation Report" but almost universally cited as "Joseon X-Files." It takes place during Korea's Joseon period, a long stretch of self-governing bureaucracy, specifically in this case the early 17th century. You can tell it's the Joseon period because most of the characters wear the semi-transparent "gat" hats. The X-files comparison is hard to avoid. There are two investigators, one with a mysterious past, the other filled with skepticism, who must investigate bizarre events at the behest of covert government forces. There's even a "smoking man" character who smokes an insanely long pipe. But there's some nice Korean flare to the stories. For instance, the premiere episode has a local governor reporting mysterious lights in the sky. The report gets him arrested because the emperor's authority comes from the heavens and heavenly omens are seen as intent to foment rebellion. I've seen about half the series so far, and sure there's some rough spots in the production. It's shot on harsh video and the live-sound is clunky at times. The locations, whether a remote village or the emperial capital, all seem to be the same eight or nine buildings. But it's not bad. The stories are imaginative and the characters compelling. Definitely worth the time for a serious science fiction fan to hunt down. If nothing else it's better than two of the three Stargate TV series. On a similar note, Kaigou just sent me a link to an article written by SF writer Gord Sellar on the general failure of Korean SciFi cinmea. Hmmm I have some remarks to make. 1.You say that the X-files comparison is 'hard to avoid', but I wonder why do you think anyone should avoid it? 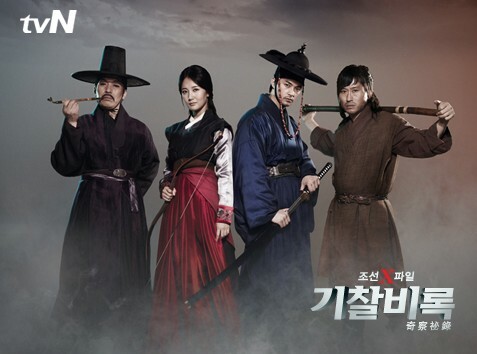 It's in the title, X FILES in joseon era = joseon x files. The producers even mentioned the american series,this series is practicaly a tribute to the original series (although it's obviously not just a tribute,in terms of quality it can easily be compared with the original series and arguably many people will say joseon x files is actually better then x files, me included). 2.You said it's shot on harsh video at times, and the live-sound is clunky ? To be honest with you I'm not sure if i get what you're trying to say, but what i DO know is that the series is shot in HD, you can easily find on the internet the 720p version, and 1080p version on private tracker. oh, and what's with the buildings-thing to add it on the "rough spots in the production" list? That's exactly how the buildings looked like back then,so why should they make them different if they were not?! Maybe the color filters aren't what I'm used to. In most western TV the extremes of the video image are softened. Could be a stylistic choice. But the audio is definitely live, and not looped, which can be distracting. But it's still a cool show. Rob223, I take it you've seen it? Are you familiar with dramas? Any recommendations?